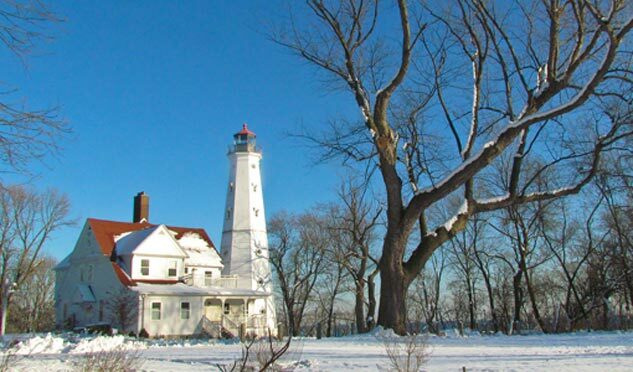 The North Point Lighthouse has a 74-foot tower and a Queen Anne-style Keeper’s Quarters. It’s located between two ravines in Lake Park on a two-acre semi-wooded parcel. Before its decommissioning in 1994, the Lighthouse contributed to Milwaukee’s trade and economic growth. It’s also one of the oldest structures that stands in the now-urban area. Since 1855, the North Point Lighthouse stood tall, overlooking the water and beaming out its light to protect and guide ships and watercraft. Keepers and their families lived and worked at the North Point Light Station, ensuring that the bright light was broadcast through fair weather and foul. It symbolizes a time in our history when waterways were the highways between cities. Lighthouses facilitated water travel and commerce on Lake Michigan, throughout the Great Lakes and beyond. Each year, visitors are drawn to the beauty and historical significance of Lake Park and Milwaukee’s East Side vintage neighborhoods. The park itself is a remarkable jewel that was conceived and rendered in 1893 by Frederick Law Olmsted. Olmsted, the designer of New York’s Central Park and the 1892 Chicago Exposition, was one of the 19th century’s foremost American landscape architects. The North Point Lighthouse has been preserved and restored to its early 20th century charm through the determined efforts of a group of committed volunteers, the North Point Lighthouse Friends, Inc., formed in 2002. Since completion of restoration in the fall of 2007, this historic site is open to the public for tours and visits.